Whether you’ve consistently given in the past or this is new to you. We all have something to contribute to the mission. Going from nothing to something is a huge step, but it is transformational. Even if you’ve never given before, AGAIN is a great time to start. Your investment will help us continue our mission as a church. EXAMPLE: Henry is a new believer. He has been growing in several spiritual disciplines, including giving. It is a huge step of faith, but he plans on committing 5% of his $50,000 annual income ($2,500) during AGAIN. You’ve developed the discipline of tithing and have seen God’s provision again and again. You are planning to continue this commitment throughout the duration of the AGAIN Campaign. 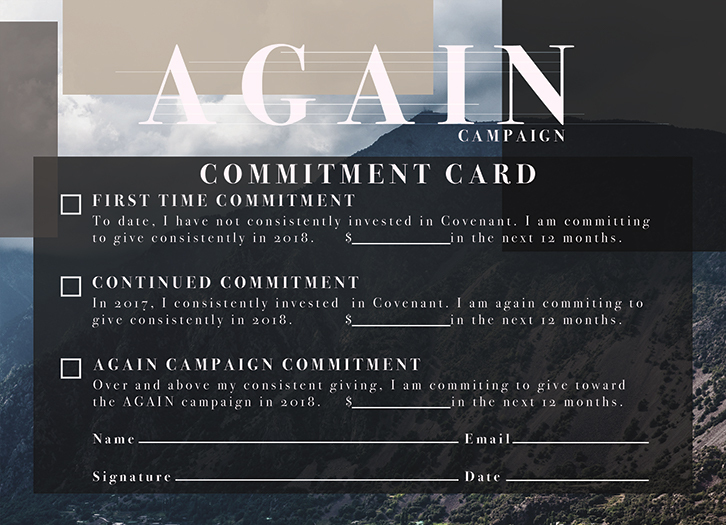 You’ve made the decision to tithe consistently, and you are ready to invest in the AGAIN Campaign. You plan to give above and beyond that of your regular tithe, or you are giving a specific gift. EXAMPLE: Andrea has made a commitment to tithing 10% of her $40,000 annual income – $4,000 – in the next year. Through continued prayer, she is convicted to take a step of faith and give an additional $2,000 over the next 12 months toward the AGAIN campaign. Her total giving over the next 12 months will be $6,000.